Media note: Rice University has a VideoLink ReadyCam TV interview studio. ReadyCam is capable of transmitting broadcast-quality standard-definition and high-definition video directly to all news media organizations around the world 24/7. Rice also has a university backdrop, 1080p web cam, light kit and wireless mic for Skype interviews. HOUSTON – (Nov. 16, 2018) – Now that the Democrats have taken back the U.S. House of Representatives, will Nancy Pelosi be chosen as speaker? Paul Brace, a political scientist at Rice University, is available to comment on the race for speaker. Brace said that some Democratic aspirants aligned with progressives and were openly opposed to business as usual. “While roughly 25 districts flipped without candidates openly opposing Pelosi, approximately four dozen Democratic House candidates said they would not vote for her to be speaker and 16 of these candidates got elected,” he said. “Of these, two candidates said they would oppose Pelosi under any conditions, while the remainder could oppose her in the Democratic caucus but vote to support on the critical House floor vote. However, Brace said public support for Pelosi is only slightly below that of exiting Speaker Paul Ryan and compares favorably with Republican and Democratic leadership in the Senate. In the end, while it is easy and popular for some Democrats to call for new leadership, most Democratic House members find themselves like wing walkers, unwilling to jump from one wing without another on which to land. Brace is widely published, primarily in the areas of state politics and judicial decision-making. He comments regularly on presidential politics and the judiciary. For more information on Brace, visit http://www.ruf.rice.edu/~pbrace/. To schedule an interview with Brace, contact him directly at 832-628-5285. 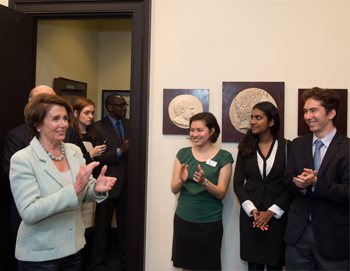 Caption: Nancy Pelosi during her 2014 visit to Rice University.